Cycling apparel is nice for long rides, providing visibility, comfort on the saddle, and flexibility for unencumbered pedaling. But it’s not exactly stylish for wearing around town (unless bright form-fitting tights and tops are the look you’re going for). Their product line includes several styles of pants ($90-$150) and shorts ($60-$95) that are designed to be more slim-fit for riding but still look good for casual wear. The slimmer fit especially pays dividends around the cuff (which can get snarled in the bike gears on regular pants). They also include a gusseted crotch to eliminate uncomfortable seams directly above the bike seat and stretchy cotton or twill fabric for a full range of motion. 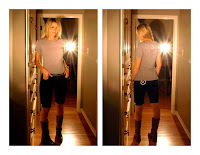 A Pedaler reflective logo is stitched into the back pocket and reflective strips are stitched on the inside of the cuffs; roll them up to expose them to oncoming headlights. T-shirts and hoodies round out the collection. Pedaler boasts strong credentials for sustainability and supports a range of cycling advocacy groups around the country. A handful of bicycle shops carry Pedaler clothing, including several in the Northeast. Here’s the complete list. I like the concept overall, especially since I’ve chewed up the right-side (gear-side) cuffs on several pairs of pants when they’ve gotten caught on the gear teeth. It’s also nice to have such versatile clothing. The amount of reflective elements in the Pedaler line is disappointing, however. If I were to exchange my bright yellow biking jacket for a darker hoodie, I would certainly want a lot more visibility than Pedaler currently offers.